Gyro Air Drums is an iPhone 4 only app that lets you play various drum pieces using the new gyroscope feature in your iPhone 4. Using a series of various virtual drums, you physically rotate around in place to see different drums that you can hit. Then just point your device in the direction of the drum and hit it by moving your iPhone up or down. 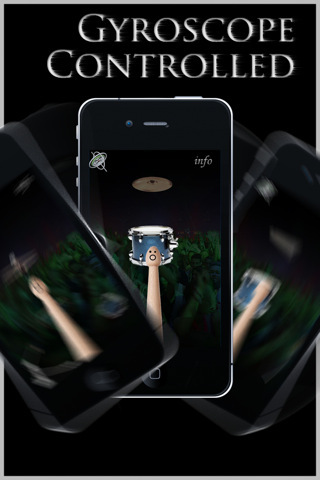 The Gyro Air Drums app uses both the accelerometer and gyroscope features of the iPhone 4, in an attempt to make drum playing almost life like in an augmented semi-reality kind of way. I’m not a drummer or even close to being good at playing the drums, but the results of this exciting experiment left little to be desired for me. There is a free lite version of Gyro Air Drums that comes with a closable hi hat, a snare, a crash, bass drum, and tom. For $3 you also get a second tom, a taiko drum, a cowbell, there’s also a rubber ducky you can smack around in there, believe it or not. While I was really excited to play this drum simulator on my iPhone 4, I didn’t expect it to be something that anyone would actually use to play an entire song on. And unfortunately my assumptions were correct. While I give the developers a ton of credit for the idea and development effort behind this great use for the gyroscope, the execution needs work. When you move the iPhone to hit the drums, sometimes it makes one hit, and other times you hear 2 beats as if you had accidentally hit the drums twice. Also the circumference of the drum pieces is a little too small so when you’re playing if you don’t keep you hand in a precise location in mid air, you might miss the drums. While its nice to be able to do a combination of bass drum with your finger tap, and snare drum with the iPhone movement, playing any other combination of consecutive beats is almost undoable, making Gyro Air Drums basically a very good proof of concept app. Again it could be improved upon and become useful as a drum simulator with some major accuracy improvements perhaps. For now I would recommend you try out the lite version if you’re curious and want an app that utilizes your beloved new Gyroscope. AppSafari review of Gyro Air Drums was written by Joe Seifi on August 9th, 2010 and categorized under App Store, Augmented Reality, Music, Utilities. Page viewed 7000 times, 1 so far today. Need help on using these apps? Please read the Help Page. Funnest iphone 4 app so far.